Fabric Lounge Cleaning by Chem-Dry. It is in the area of fabric lounge cleaning where Chem-Dry stands out. Lounge cleaning is difficult and risky and many companies simply walk away from some of the challenges out there. There is no substitute for knowledge, skill and experience when it comes to fabric lounge cleaning. Our professional technicians are able to clean any type lounge. Keep your lounges looking good. Inspect the fabric lounge cleaning and test the material if required. Set up a mobile work station and protect floor surfaces. Pre-treat all stains with the range of Chem-Dry cleaning solutions. Complete the sofa cleaning with the option of protecting the fabric afterwards. We strongly recommend the protection of light fabric upholstery to make future maintenance easier. Drying of sofas where water damage has occurred. Sanitise upholstery that has been contaminated. Dust Mite treat furniture where allergic reactions are a problem. Wet fabric lounge cleaning. This entails the process of hot water extraction followed by speed drying with air movers. Wet/Dry combination fabric lounge cleaning. Dry cleaning of upholstery reserved for delicate fabrics. We can take care of a wide range of fabrics. 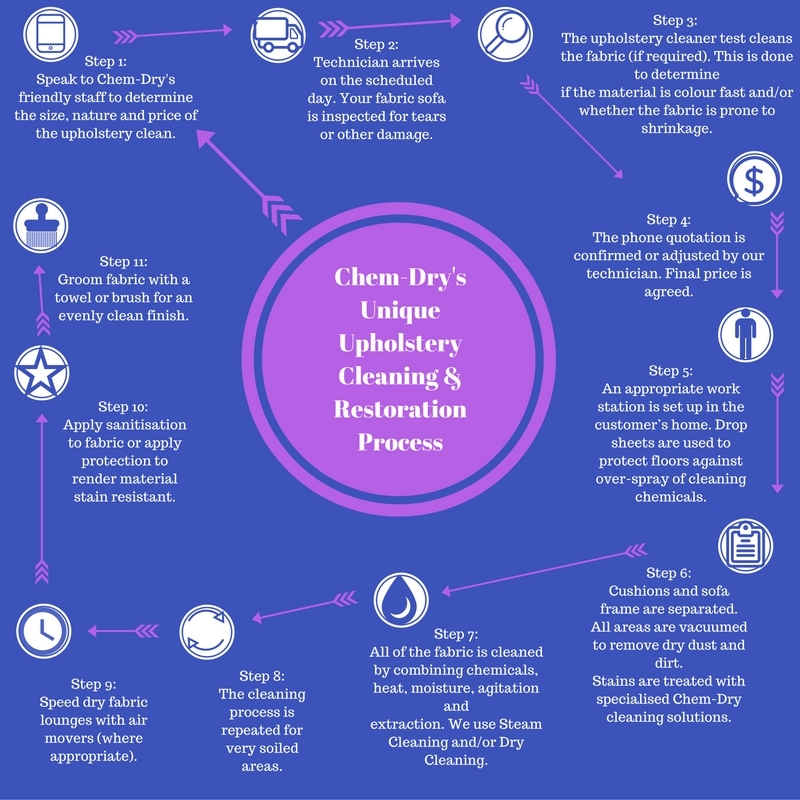 Contact Chem-Dry Australia for a list of expert sofa cleaners throughout Australia. Let us be the ones to take care of your fabric lounge cleaning needs in Sydney. Carpet Cleaning & Protection. Leather upholstery cleaning & Protection. Air Conditioning treatment Smoke damage restoration and protection. Commercial Carpet Cleaning. Pet odour removal.